The Harry Potter franchise has spawned some truly amazing merchandise including the five fantastic items on this page that really are perfect gifts for any Harry Potter fan, young or old. Each of these best Harry Potter gift items would double up perfectly as party decorations for Halloween or Birthday parties and then magically become a part of your Harry Potter themed room. 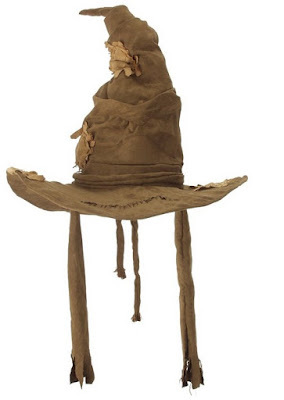 What Harry Potter decor would be complete without a sorting hat? Fans will know that the sorting hat is used when you arrive at Hogwarts and that it sorts you into the house you will be part of, whether that be Gryffindor, Hufflepuff, Ravenclaw or Slytherin. The sorting hat would make a magnificent centerpiece for your Harry Potter table or for your Harry Potter costume. Click here to order your Harry Potter sorting hat from Amazon. 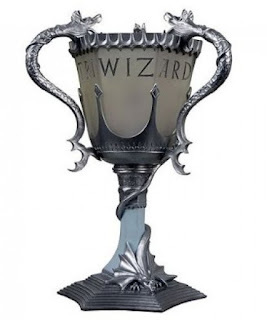 The Triwizard cup represents the trophy that is given to the winner of the Triwizard Tournament at Hogwarts. This replica is quite amazing, I love it because it is really a lamp! It is recommended by the manufacturer for individuals over 3 years of age. A lovely piece, a collectible, this lamp is 12 inches tall. Click here to order your Harry Potter Tri Wizard Cup lamp from Amazon. 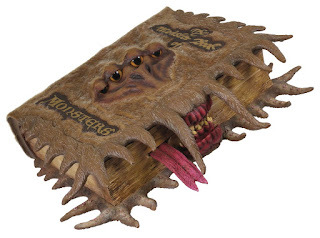 The Harry Potter Monster Book of Monsters plush shown here is a book that growls when you pull the tongue. It is a great prop for your Harry Potter Halloween party or costume. It is recommended for individuals eight months of age and older. Another version is the electronic version, shown to the right. It is my favorite because it is more than a toy. 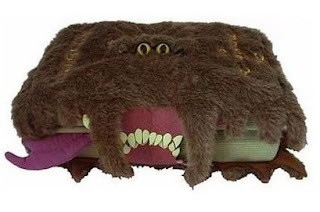 It will actually keep your treasures safely locked up inside and it has sound and animation effects that include ghastly growls and snarling teeth to keep intruders away. Click here to read more about the plush Book of Monsters on Amazon or here to read more about the electronic version. The Marauder's map maps the interior of Hogwarts School of Witchcraft and Wizardry. It shows the classrooms, hallways, grounds, secret passages and every single person that is at Hogwarts. It can also identify each of those people making it a extremely useful tool for Harry Potter. This Noble Collection Marauder's Map will help you find your way around Hogwarts and it will also make a great decoration for your Harry Potter themed room. It is a replica, in full size, which measures 15.5 by 72 inches (when opened) and which has been printed on parchment paper. 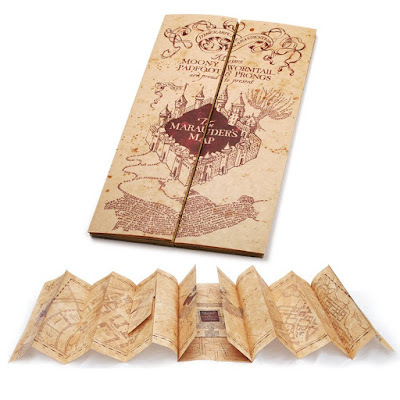 Click here to order your Marauder's Map from Amazon. Another perfect Harry Potter gift item is the Harry Potter marauder's map pillow. Another high quality item from NECA, it measures 17 by 14 inches and is recommended for individuals 13 years of age and up. 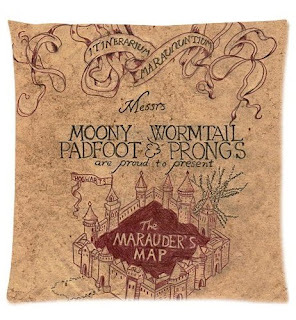 Click here to order your Marauder's Map pillow from Amazon. Okay, I'll admit it. I always use a throw blanket when I am watching television but I do not have a throw blanket that I like as much as this one that features the all important Marauder's Map from Harry Potter. 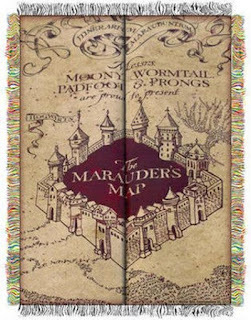 Click here to order your Marauder's Map throw blanket from Amazon. My son owns this Marauder's Map coffee mug (shown below) from the Wizarding World of Harry Potter and it is handsome. If you are looking for a practical Harry Potter souvenir or gift, I can highly recommend this coffee mug though be aware that it is big, very big! 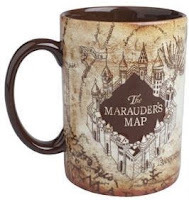 Click here to order your Marauder's Map coffee mug from Amazon. I hope that this page has given you some more Harry Potter decorating ideas. Hogwarts School of Witchcraft and Wizardry!